I must admit that Craps is my favorite casino game other than poker. I learned how to play on my parents’ pool table, when my dad constructed the table using playing cards to represent the respective numbers and masking tape to rope off the various bets. It’s one of the best games from a house edge perspective, and has by far the most table camaraderie of any game in the casino. When the table is hot, you can hear it from anywhere in the building. Craps can appear to be a daunting game, but it’s actually quite simple at its core. A “come out roll” establishes the “point” number. Let’s call it a 6. A white “ON” button will be placed on the 6 (“SIX”) on the table signifying that the “shooter” must hit that number before a seven in order to win. In the interim, there are several other bets which may be wagered that are also dependent on the outcome of the rolls. This table shows us all the ways a number can be thrown. You’ll notice that 7 is the most common number, which is what the entire game is predicated on. Now let’s talk about two basic strategies — the Pass Line/Come and Place Bets. Let’s say we are at a $5 table with 10x odds. 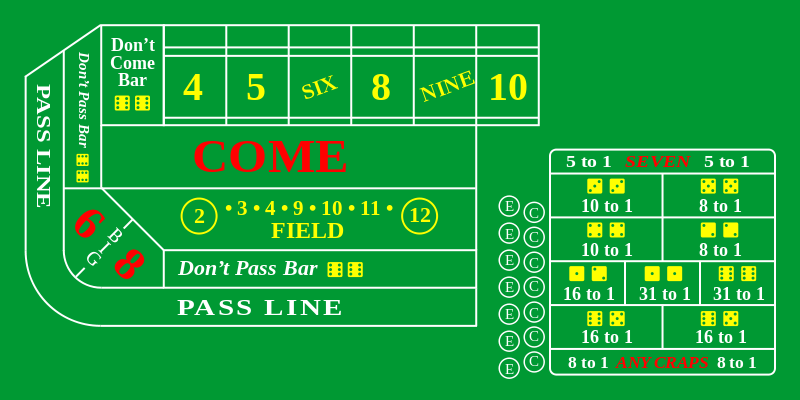 Pass Line: Look up at the craps table image above. You’ll see a “Pass Line” going around the outside of the table. This is where all the action begins. Before the dice are handed to a new shooter, we’ll put our first $5 bet down on this Pass Line. If the shooter rolls a 7 or 11 on the first roll, we win $5 (1:1). If he rolls 2, 3, or 12 (called “Craps” numbers), we lose our $5 and must replace it before the next roll. If he rolls a 4, 5, 6, 8, 9, or 10, then we have established our “Point.” For our purposes, let’s say the point is 6. As mentioned above, the point of the game is to roll this “Point” number (6) again before rolling a 7. If a 7 is rolled before a 6, we lose. If a 6 is rolled before a 7, we win (1:1). Pretty easy, right? The 4-10, 5-9, and 6-8 all have the same “odds” because they have the same number of ways to roll the number (as we saw above). As a result, we only need to memorize three sets of numbers — the “True Odds” column on the far right for 4/10, 5/9, and 6/8. Notice how the payouts decrease with the numbers closer to 7 because there are more combinations of those numbers. In other words, it’s harder to hit a 4 or 10, so the payout should be more than hitting a 6 or 8. Come Bets: Now that you have Pass Line and Odds bets mastered, let’s look at Come Bets, which are very similar to what you already know. Think of a Come Bet as a second come out roll. In order to bet the Come bet, put a $5 bet in the area labeled “COME” right in front of you on the table. If a 7 or 11 is rolled, you win $5 on this bet. If a 2, 3, or 12 is rolled, you lose the $5 bet. Just like on the first come out roll on your pass line bet. But if a 4, 5, 6, 8, 9, or 10 is rolled, that $5 COME bet will travel to the number and now you’ll have a second number working for you. At that point, you can apply odds to the bet just like you did at the Pass Line. Let’s do an example. As we mentioned above, you have a pass line bet and the come out roll yielded an 8. You placed the come bet down and the second roll is 9. The $5 chip travels to the 9 (or “Comes” to the 9) and you now have an 8 and a 9 working for you, with the same rules applied (now you want to roll an 8 or 9 before 7 to get paid). Similar to the Pass Line bet, you can put your “True Odds” behind a Come Bet too. When the 9 is rolled, just lay down $10 in front of your dealer and say “Odds on the 9.” He’ll place the odds on the number, and if the 9 hits before the 7, you’ll get paid just like you would if the 9 was your pass line bet. You can repeat this process and get as many numbers as you wish, but I prefer to have 3 numbers working for me (with odds) at one time. It limits my exposure, but also gives me an opportunity to win during a good roll. Place Bets: Let’s say you’re not into all that math and garbage listed above. You just want to play some dice. You don’t want to think. You just want to bet the numbers you like without having to roll the number twice to get paid. I get it. You may be a place bettor. Similar to the odds bets above, though, you’ll need to know a tiny bit of math to understand place betting. Let’s say you want to bet the 6 and 8. In order to “Place” your bet, you need to put down an increment of $6. The reason being that “Place” betting the 6 and 8 has a payout of 7:6. So for every $6 you put out there, you’ll win $7 every time a 6 or 8 hits. If you place the 5 or 9, then you can put increments of $5 out there because the payout is 7:5 ($7 for every $5 you bet). Last, if you place the 4 or 10, you can put increments of $5 out there because the payout is 9:5 ($9 for every $5 you bet). Just remember that if you’re placing the 6 or 8 (or both), you need to give the dealer an increment of $6. For all other place bets, you can give an increment of $5 (assuming it’s a $5 table…if it’s a $10 table, your $6 becomes $12 and your $5 becomes $10). Conclusion: There’s also a gazillion other bets on the table I could discuss, but they’re not near as good for the player as the ones listed above. Start with this and then move on to new bets if you want to have a little entertainment. For more information about the house edge in craps as well as other strategy information, check out the Wizard of Odds Craps Page.